I’ve skipped out on new year’s resolutions for many years. I’ve never even been a fan of New Year’s Eve as a celebration, and as a result, to me, the beginning of the new year has never felt like the right occasion to reflect on the past or find points to improve. A couple of years ago I decided to participate to this global game. And guess what, it actually helped me stay on track. I tweeted out three resolutions, and at the end of the year I had met two of them, which I understand it is way better than typical ratio of met to missed intentions. So, without further ado, let’s do it again. Here are my resolutions for 2017. It’s easy to say “this year I’ll start working out,” “this year I’ll be eating healthier,” but those are typically resolutions that don’t make it past January—any regular gym goer knows what’s the busiest month of the year, and I don’t want to fall in that trap. I’m not saying I don’t need to start with something entirely new, but I do have to focus on being more consistent with what I already do. Bass practicing, learning to code, reading, blogging, those are all activities that need more consistency than I’ve managed lately. As an extension of the resolution #1, I need to have clear short, medium and long term goals to keep the consistency level high. It’s not a matter of motivation though. Bear in mind, I’m not a fan of “motivation”, I don’t think that motivation should be my driving force and I don’t believe that there’s anything out there that is “all about motivation.” When goals are set in stone, everything else is up to me and my discipline. Why do I keep practicing with my bass guitar? Short term, to keep nailing songs. Mid term, to go out there and get some new gigs after a couple of years of “I don’t have time for this.” Long term, to produce something mine. Why am I learning to code? Short term, to better understand what’s going on in the techiest side of industry in which I’m working. 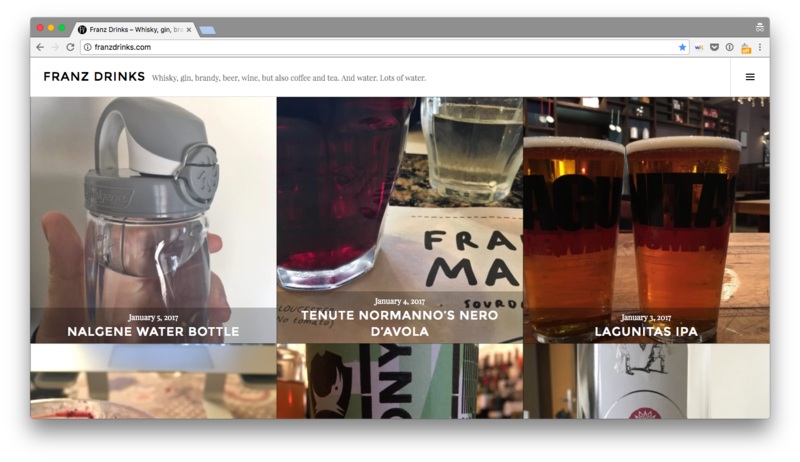 Mid term, to build something mine—just a fresh theme for Franz Drinks, or maybe a new little product. Long term, to be able to perform at least junior dev tasks whenever needed. These of course are just wide, sort of foggy goals I’m jotting down here to give you the idea. Practicing, improving, learning without goals is just pointless. Everyone who cares about a community needs to constantly remind themselves the point of it all. Bringing people together. In the past, I’ve written up massive rants on social media about religion, politics and society, and whilst my original goal was to kick off important discussions, the major outcome I was getting was another one. I was dividing people. I’m a big believer in sharing thoughts and speaking my mind, but I need to ask myself more frequently what kind of emotions I trigger with any type of post or comment I flesh out. Am I giving people something that will cause unnecessary disputes? Will people feel forced to take sides? If so, I ought to think more before hitting the publish button. Whatever it is that you’re planning for this year, whether you have ambitious goals or want to transition to something else (and maybe achieve bigger things in 2018—that’s fine too! ), take good care of yourself, be happier, be healthier, and give everyone around you a reason to smile. Out of Office, our online event about remote work, is today. Are you joining us?